Most people want to live in a town or city. 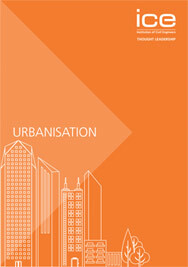 So as urban populations continue to grow how do we change the way we plan, design and build in order to keep up? Here, you can see and listen to those on the frontline delivering urban infrastructure. Do we build our way out of trouble or do we make better use of the assets we have by adopting new technologies? I want a city that is designed for people not machines, where there is green space, affordable housing, clean air, great public transport and where history and innovation sit together. We are outgrowing our cities, not only in terms of population but also in what we expect from them. The need for sufficient, good quality housing, transport, green space and community has to be balanced with the seemingly insurmountable challenges of climate change and resource depletion. Building in ‘community’ as population density increases. Housing need vs green spaces, natural water pressures. Is car free the future, how much capacity do we need? What does a smart city look like? Technology’s sustainability role. Combating poor air quality and reducing pollution while helping cities to grow. We want to encourage the widest views on these big issues. We welcome think pieces, comments, opinions, blogs. In written form or video. Can we create the cities we want?